First off, I'd like to say thank you to anyone stumbling onto this blog with any interest in vintage horror films. That automatically makes you cool in my book! 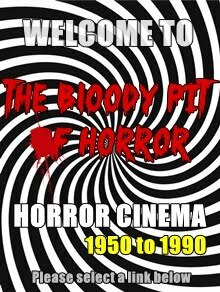 The Bloody Pit of Horror is dedicated to my favorite eras of horror cinema; the 1950s through the 1980s. Why this period? It could be that as a child of the 80s and a teenager of the 90s, I grew up on these films, whether going to the local video store to rent them, going to the theaters to see them or watching them at 3 in the morning on now-defunct late-night TV shows such as "Monster Vision" or "Up All Night." Or it could also be that I feel these three decades have the broadest scope and the most variety to offer from a bigger variety of countries. One thing's for sure; horror was booming during this period and many of the big names were just getting their start... By concentrating on this period in horror history I get to touch on the big worldwide sci-fi boom of the 50s, then move on to Hammer horrors, AIP, German krimi, Japanese monster mashes, and the Italian Gothic horror renaissance in the 1960s. The fall of censorship laws toward the end of that decade means I get to see what directors all over the globe did with their new found cinematic freedom in the 1970s (drive-in classics, TV movies-of-the-week, giallo, major studio releases that managed to snag major awards and some of the most twisted and sleaziest films imaginable). 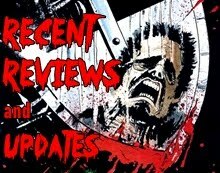 The 80s brought a whole new attitude; a wave of slasher flicks, gory horror-comedies, endless sequels, the occasional foreign art flick that didn't seem to fit but was most welcome anyway, and much, much more. 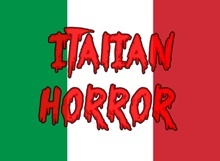 The director's reigning supreme during this period are some of the most famous and most important genre filmmakers around - Dario Argento, Jack Arnold, Mario Bava, John Carpenter, Larry Cohen, Roger Corman, Wes Craven, Joe D'Amato, Terence Fisher, Jesus Franco, Lucio Fulci, Ishiro Honda, Herschell Gordon Lewis, Jean Rollin, George A. Romero and scores of others. It's no accident that many of these directors are still busy at work today, and the ones who aren't like aren't only because they've passed on. The subject matter is endless... mad scientists, vampires, ghosts, zombies, werewolves, Satanists, sadists, giant lizard monsters, serial killers, Gothic seductresses, undead slashers, flesh-eating cannibals... The films are in beautiful black-and-white or "blood-dripping" color. From ambitious art films to award winners to unadulterated sleaze-fests that continue to shock and amaze to this day... This is the prime era of horror, if you ask me. It's no wonder so many movies being produced today are trying to cash-in on the "grindhouse" / retro flavor of this time. It's also no wonder so many of these films have been "remade" in recent years. It's just simply a terrific and diverse period in film history. Of course I'm going to be missing out reviewing some fantastic films by limiting myself to just three decades. Some of my favorites, actually. From the silent, expressionist German classics to Chaney's gems to the Universal Horror monster classics of the 30s to the Val Lewton-produced masterpieces of the 40s, all the way to today's current releases. I can't say it's not difficult to limit myself, but doing them all would just take too much time and way too much space. These other titles naturally will be mentioned from time to time in the reviews, for reference sake, so I'll try to put a good word in for them whenever I can. well, numerous people were curious what I looked like. So now ya know. 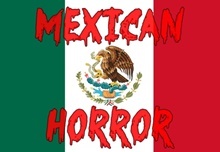 My ultimate goal with this blog is to catalog every single horror film that falls into the chosen time frame. I hope to watch as many of these as possible. If I can't find the movies, I plan on providing cast / crew information, a poster and / or VHS / DVD cover and a plot synopsis for the them. Hopefully all of the links will be open eventually, but right now I'm concentrating on the films I have seen and can provide reviews for. Since technically speaking, the 1980s would also include 1990, I'm including 1990 titles here as well. Titles will be listed first and foremost under their original release title, whether it be English-language or not. I'll list as many alt. titles as I can dig up for the foreign ones so you should be able to find the film on here using that handy feature on the top left corner. When it comes to the year, I'm using IMDb as a guideline unless I know otherwise. If a film was made 2 or more years before receiving a release, the production year will be noted. I also am including films whose production / copyright date may fall within the guidelines but whose release date does not. I'm doing this so every title someone might expect to find here is found here. Films are evaluated on an 8 point scale, from 4 stars (excellent) to 1 star (terrible). Below "terrible" (yes, some film do sink lower than that), the worst of the worst are divided into two groups, so-bad-it's-good (which are often so entertaining in their own way they transcend a rating) and so-bad-it's-unwatchable (which will be given the "NO STARS!" kiss of death). I grade strictly on quality because one man's garbage may be another man's treasure, and vice versa. 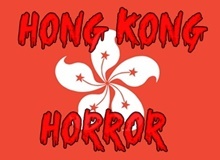 Meaning, films like Shriek of the Mutilated or Blood Freak will receive a low rating even though I personally adore both of them in all the badness. I feel that grading on entertainment value alone is a bit misleading since we all have our own idea what qualifies as a "good-bad" movie. I prefer to just call a spade a spade, and let the viewer decide whether that film's ineptitude amuses them or not. ★★★★ = Excellent. The best the genre has to offer. ★★★1/2 = Very Good. Perhaps not "perfect," but undoubtedly a must-see. ★★★ = Good. Accomplishes what it sets out to do and does it well. ★★1/2 = Fair. Clearly flawed and nothing spectacular, but competently made. OK entertainment. ★★ = Mediocre. Either highly uneven or by-the-numbers and uninspired. ★1/2 = Bad. Very little to recommend. ★ = Very Bad. An absolute chore to sit through. NO STARS! = Abysmal. Unwatchable dreck that isn't even bad-movie amusing. SBIG = So Bad It's Good. Technically awful movies with massive entertainment value. I hope everyone enjoys this blog and what it has to offer. This is, of course, constantly under construction and numerous changes will be made along with way. Right now I'm trying to acquire films from this time period and post all of the reviews I've already written, which I have saved either on a word file or under my IMDb account. Comments or feedback, positive or negative, are always welcome. Once I get the Index for each letter up and running, please make sure to let me know if I'm overlooked a film produced between 1960-1990, and I will make sure to add it to the list and give you a shout-out for helping out. Thanks again for taking the time to visit! Just wanted to say that I love your site and reviews! Looks like you decided to do reviews for 50s films as well so you might want to edit this a bit. Other than that fantastic job! I really had no idea there were so many horror films from this time and many I hadn't even heard of before. Looking forward to reading more from you. Thank you all for the nice comments. I did forget to change this to to include 1950s films. I'll edit it when I get the chance. Thank you for keeping this blog. I'm enjoying it. Good luck watching so many movies! Great site, man! Good to see another site that examines what I consider to be the "golden years" of horror cinema. For some reason, I thoroughly enjoy reading people's different opinions on horror flicks. Which is probably why I have so many horror reference books. One I highly recommend is "Nightmare USA" by Stephen Thrower. Truly the deepest examination of Independent "American" horror in the 70's and 80's that I've ever come across. Anyway, keep up the good work. Peace. I stumbled upon your blog yesterday, and I think it's awesome. You're not only a talented writer, but you also happen to have the same taste as me... That's why I just copied all your top 10 lists into a file in order to get all the movies listed there that I haven't seen until now. Thank you both very much. Haven't had a chance to do much updating this year but I hope to change that here soon. I have read and very much enjoyed Nightmare USA. There are many film covered in there that I haven't yet seen. Only to say that i love your blog, and that is a great point of reference for looking diverse opinions in movies i love and hate. Please go on with it! Just droppin in to say hi and loving the look of this place! I came across your blog and thought it was great. We are inviting a select few contributors to Moviepilot, and would love to add you as a contributor. This would mean more recognition for your work due to the large community we already have here on Moviepilot, with 2 million visitors a month and 11 million fans on Facebook. We'd love to have you onboard, so let me know and we can get you set up. You can find more information at: http://moviepilot.com/contribute and feel free to let me know if you have any questions. Good to have you back. I was starting to think you had come to a sticky end. Thanks Luke. I hate leaving for such a long period of time but sometimes life gets so hectic you don't have much of a choice in the matter. 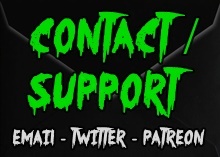 Great site keep it up, beats all the mainstream horror crap sites. Thank you. Doing as best I can as time allows. Unfortunately I've been short of it this past year. Hope that changes.